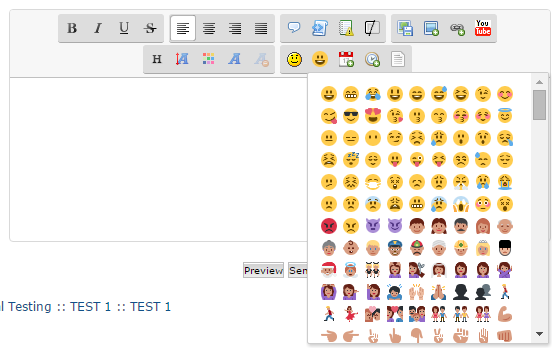 This trick will help you add twitter emoji to the editor on your Forumotion forum, so you can use them in messages, PMs, etc..
Save the script, and you should now have a new button on your editor for inserting Emojis in your messages. For modifications, please see the next section. emoji_size : Defines the default size of the emojis ; 16x16 by default. The sizes available are 16, 36, or 72. You can change this for larger or smaller emoji icons. button_title : Defines the tooltip text displayed when you hover over the emoji button. auto_close : Setting this option to true will automatically close the drop down once you've picked an emoji. Set this option to false if you don't want the drop down to close. async_load : This option is for performance. When set to true it will load one emoji after the other without making the browser wait. Setting this option to false may reduce performance, but it will load all emojis at once. However, this can make the browser unresponsive for a few seconds if there is a large amount of images. This tutorial was written by Ange Tuteur.